Whether you are purchasing a used RV or you already own an RV it’s a good idea to periodically inspect it for any water damage. I would list water damage as the number one problem RVs experience. RVs flex when they travel down the road and sealants dry out and separate, especially when the RV is exposed to the elements. Inspecting your RV for water damage can save you lots of money if you find the leak early and take care of the problem. This post is intended to give you a logical process to follow so you can properly inspect your RV for water damage. I recommend inspecting the RV for water leaks twice a year at minimum, once in the fall and again in the spring. The first thing you need to understand is that every seam on your RV, and anywhere the RV manufacturer cut a hole in your RV has the potential to allow water in. It’s important that you take your time and really inspect all of these seams and sealants on the RV. I always say that water damage on an RV is similar to progressive damage to a tire. The outside of the tire still looks fine, but the internal damage over period of time causes the tire to fail without any warning. The outside of your RV can look okay but the internal damage caused by water over a period of time can result in the entire roof, floor or wall rotting away without you knowing it. 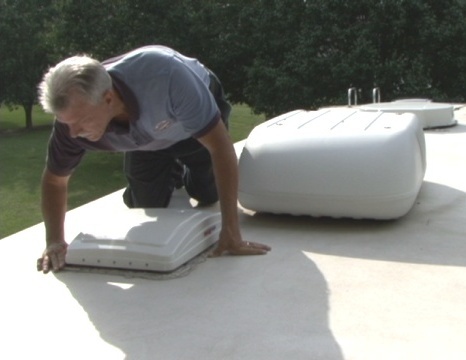 Caution: Always keep safety in mind when you are working on the roof of your RV. A slip or fall can cause serious injury or death. Look for any discoloration and feel for any soft spots on the ceiling around roof vents, air conditioners, TV antennas, plumbing vents, and any other openings that were cut in the roof. Discoloration and soft spots indicate there is already serious water damage. Look for any discoloration or wrinkles in the wallpaper, and feel for any soft spots on the walls around all windows, doors, vents, slide-outs, or any other openings that were cut in the RV sidewalls. Identify the location of items like the water heater, furnace, outside shower, potable water fill and city water inlet on the outside of the RV and then access those smae areas from the inside of the RV. Look closely for any indications of water damage around these openings. Open all overhead cabinets and look in the top corner where the walls meet the ceiling for any discoloration and feel for any soft spots. This would indicate a leak at the seam where the sidewall and the roof attach. Check in all outside storage compartments for any indications of water leaks or water damage. Check for any soft spots on the roof itself especially around the roof seams at the front and rear of the RV. Thoroughly inspect all sealants on the roof around every opening. Look closely for and cracked or separated sealants that would allow water to penetrate the surface. Some Type B and Type C motor homes are notorious for leaks in the cab over bed area above the driver and passenger seats. Look for any signs of discoloration and feel for soft spots. The best way to do this is to remove the mattress and physically get up in the cabover section and feel for moisture, water or soft spots. Look and feel on the outside of the RV for any signs of delaminating. 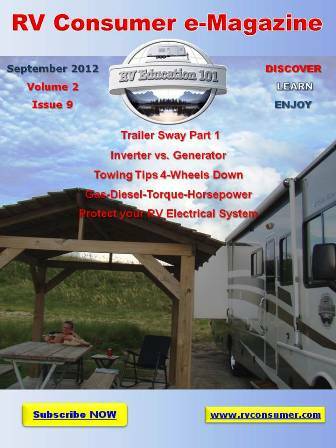 Delaminating is caused by water getting between the exterior fiberglass and the RV sidewall. When this happens the exterior fiberglass separates from the sidewall of the RV. You can stand at the front or rear of the RV and look down the side for any noticeable ripples or what looks like a bubble in the fiberglass. You can also press on the sidewalls to feel for soft spots or air pockets. If you feel the exterior fiberglass move it is delaminating. Often times delaminating starts around where an opening was made in the sidewall. Delamination repairs can be very expensive. Inspecting these areas on a regular basis can identify a problem before delamination starts. The key is that you really inspect your RV for water damage. Take your time and look closely for anywhere water can find its way in the RV and make the necessary repairs. If you do this on a regular basis you can locate and repair the source of any water damage before it has a chance to do lots of damage.